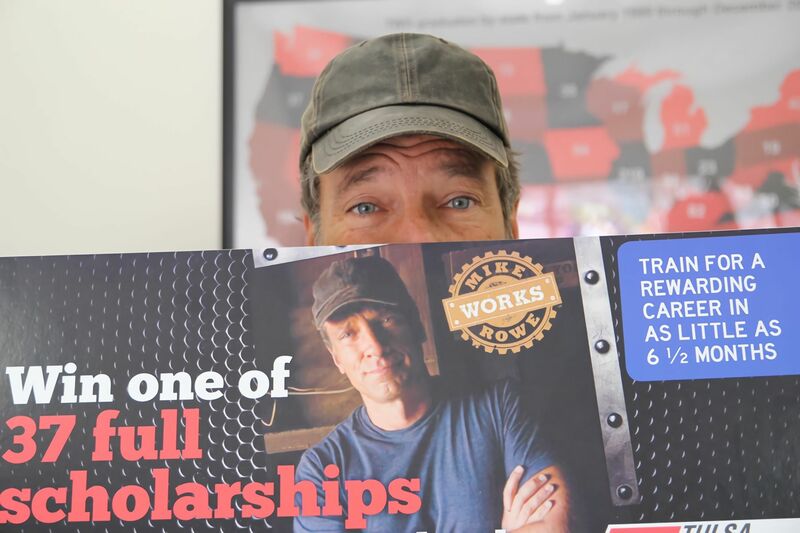 The mikeroweWORKS Foundation and Tulsa Welding School are pleased to announce the creation of the MRW/TWS Scholarship Program for high school seniors. The mikeroweWORKS Foundation (MRW) and Tulsa Welding School (TWS) have partnered to offer scholarships at TWS’s campuses in Tulsa, OK and Jacksonville, FL. A total of 49 full-tuition paid scholarships will be offered, with a collective value of approximately $800,000, across its campuses in Tulsa, OK, Jacksonville, FL and its sister school, The Refrigeration School (RSI) in Phoenix, AZ. a. A 500 word essay explaining why the applicant is interested in a career in the skilled trades. b. A copy of the S.W.E.A.T. (Skill & Work Ethic Aren’t Taboo) Pledge signed by the applicant. c. Proof of the applicant’s high school GPA. d. Records reflecting the applicant’s exemplary high school attendance. e. A minimum of 3 letters of recommendation (recommendations may come from teachers, coaches, counselors, community service organizations, or employers). f. Documentation of the applicant’s need for financial aid. 3. Up to 100 of the top applicants at each campus will be asked to submit a 2-3 minute video, which will be posted on TWS’s Facebook page, explaining why the applicant deserves a MRW/TWS scholarship. 4. The public will choose the MRW/TWS Scholarship winners by voting on Facebook for the applicants the public believes most deserve the scholarship. The top applicants whose videos have the most votes will be awarded a full-tuition paid scholarship to one of TWS’s Programs. Visit https://www.weldingschool.com/financial-aid/scholarships/ for a complete list of Terms and Conditions. In order to qualify for the MRW/TWS Scholarship Program, applicants must be scheduled to graduate from high school during the 2013/2014 academic year. mikeroweWORKS was launched in 2008 as a Trade Resource Center for people seeking employment opportunities in the skilled trades. The initiative grew from the hit TV show Dirty Jobs with Mike Rowe, and quickly turned into a grassroots PR Campaign for hard work and skilled labor. In 2010, mikeroweWORKS became a non-profit Foundation and began to award tool scholarships, travel stipends, and other financial assistance to those pursuing a skilled trade. mikeroweWORKS scholarships are now synonymous with “Work Ethic Scholarship,” and Mike has partnered with numerous companies and like-minded organizations to reinvigorate the skilled trades. Most recently, mikeroweWORKS teamed up with Caterpillar to launch profoundlydisconnected.com – a direct challenge to the marketing campaigns that currently promote four-year degrees at the expense of more affordable and more practical trade schools. Tulsa Welding School (TWS), founded in 1949, has campuses in Tulsa, Oklahoma and Jacksonville, Florida. Tulsa Welding School is accredited by the Accrediting Commission of Career Schools and Colleges (ACCSC) and is a member of the American Welding Society and the Career College Association. Accredited School, ACCSC. TWS-Jacksonville is a branch campus of Tulsa Welding School, located at 2545 E. 11th St., Tulsa, OK 74104. Tulsa, OK campus is licensed by OBPVS and ASBPCE. Jacksonville, FL campus is licensed by the Florida Commission for Independent Education, License No. 2331. Accredited in Indiana by the SWIC (AC-0290) and licensed by the Mississippi Commission on Proprietary School and College Registration, License No. C-668. GI Bill Eligible (check with local campus for specific eligibility). For more information about our graduation rates, the median debt of students who complete our programs, and other important information, please visit our website at: https://www.weldingschool.com/student-resources/regulatory-information/. All media inquiries should be directed to Shelly Short, Shelly.Short@stratatech.com 602-490-3459.